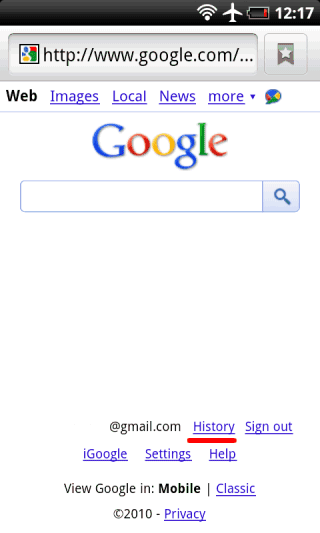 Google added a link to a mobile version of Google Web History at the bottom of the homepage for iPhone and Android users. The mobile Web History lists the most recent searches, the search results you’ve clicked on and your bookmarks. You can also remove some of your searches. There are many missing features: you can’t search the history, you can’t restrict the queries to image search or Google Maps, you can’t search your bookmarks or find bookmarks that have a certain label. Google only shows the most recent 10 bookmarks, which seems an arbitrary limitation. The most interesting feature that’s not available in the desktop interface is showing thumbnails next to each web page. “If you’ve enabled search history in your account (tap ‘Settings’ and select ‘Save Searches’ under ‘Search History’, then tap ‘Save’), the history that you see is a combination of all your searches done while you are signed-in, whether you are searching from a laptop at home, your desktop computer at work, or your phone while on-the-go. Your mobile searches are marked with a little phone icon so you can tell them apart. For websites you’ve visited while searching on a desktop or laptop, you’ll see screenshot thumbnails that can help you recognize and return to the right sites quickly,” explains Google. A quicker way to see your most recent searches is to click on the search box from Google’s homepage. If you don’t have an iPhone or an Android phone, here are the links to Google’s mobile site: http://www.google.com/m/gp and the mobile Web History: https://www.google.com/m/history?action=gethist.